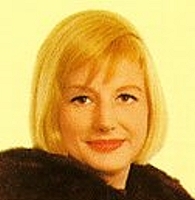 Blossom Dearie, vocals and piano; Freddie Logan, bass; Allan Ganley, drums. Recorded live at Ronnie Scott's Jazz Club, London in July 1966. As one who has always advocated and celebrated outstanding individuality in jazz performance, I raise my hat to the vocal/piano worldly wit and wisdom of Blossom Dearie and the inimitability of her small, but perfectly formed voice. Essentially, that much misused word 'unique' applies to the singing/ playing of Miss D. A comment she made to me on the simplified style of Astrud Gilberto could easily have described her own approach; "It's so refreshing and different from the big belters". 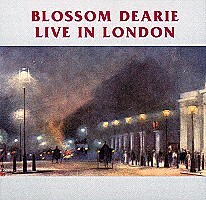 CD cover: A Japanese Artist in London (Chatto & Windus, London, 1910) water colour of Hyde Park Corner by Yoshio Markino. One thing that endears Blossom to me is that she always sings such beautifully romantic songs. She sings them sweetly, like the girl next door, not at all romantically, but with a pure innocence that makes you want to crush her in your arms, to protect her from all evil. That's what I feel when I listen to her, at any rate. And look at her picture up aboveisn't she gorgeous? Having got that off my chest, now to things in hand. On this CD she plays some very good jazz, at times really inspired jazz. No delicate tinkling behind her vocals. She storms away on The Great City with percussive fillins and goes right into a swinging chorus after the vocal that inspires Allan Ganley into some explosive fill-ins of his own. In Satin Doll the two of them get into a hot duet, a question and answer routine that really shakes the place. Freddie Logan provides a solid bass throughout, plus some interesting solosthe one in I Wish You Love gets so emotional that it almost sounds as if the bass is singing the lyric. With all of the romantic lyrics this girl is pouring out, there is no hint of suggestion in her delivery. She tends to throw away some of the leading phrases almost carelessly. She doesn't really care, she seems to say, whether you love her or notif you are interested, evenand this makes her all the more desirable. OhBlossom is wicked! This is night music. Turn the lights low, close your eyes and dream. Blossom is there, beside you, and she is singing to you alone. UK/EIRE DISTRIBUTION PINNACLE RECORDS LTD.